The annual EuroStar Award for exceptional performance is given to one European leader and one European follower at ESDC, who show talent and potential, and have exemplified the spirit of the dance throughout the weekend. As well as a trophy and inauguration into the EuroStar Hall of Fame, the winners will also receive free passes to swing dance events around the world, for a year of fun, development and exposure, to encourage them to pursue their love of dancing. The 2013 winners were Marcos Agote (Argentina/Spain) and Ciana Skeete (UK). The 2012 winners were Alex Parker (UK) and Cat Foley (UK). Below are the events and programs that have kindly donated to the 2015 EuroStar Award. If you would like to contribute to the prize for the 2015 EuroStar Award winners, please contact eurostar@europeanswing.com. 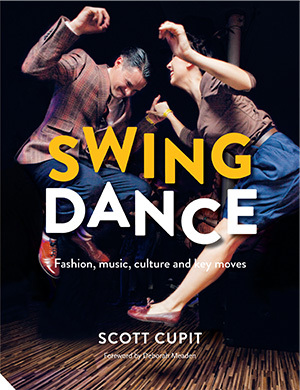 The 2015 EuroStar winners will each receive a copy of the new book “Swing Dance: Fashion, Music, Culture and Key Moves” by Scott Cupit, one of our very own 2015 judges and owner of multi-national swing dance school Swing Patrol. We love the lindy hop. Seriously. When we first started to work together, we wanted to try our hand at competing. Naturally we picked the biggest Lindy Hop contest in Europe! We had no expectations of winning anything, only of swinging out so hard we might vomit. But the result was something we could never have dreamed of. To have a panel of some of the best lindy hoppers in the world say that you are the ‘Spirit of Lindy Hop’ is the most incredible feeling. We weren’t the best dancers there, not by a long shot, but they saw something in us that was worth supporting. And the prize… 42 tickets to some of the best swing events in the world. Tickets we could never afford, to places we wouldn’t even dream of going to. We dropped everything. Alex took a gap year from uni, Cat quit acting. We moved to the same city to train together everyday. We started booking flights. We are still on this incredible journey and haven’t looked back once. Our brains are full. Our bodies are tired. But we are filled with passion. The EuroStar award took the flame of excitement we had and exploded it into a fire. We cannot be grateful enough to ESDC for giving us this incredible opportunity.